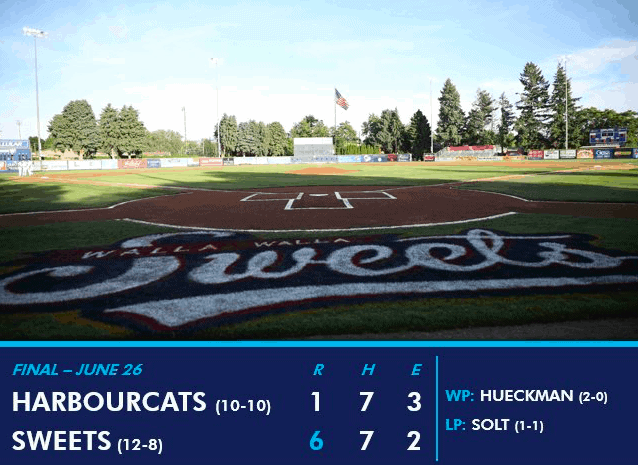 June 26, 2018 – Michael Malinchak got the Victoria HarbourCats (10-10) on the board early, but the pitching staff would proceed to give up six unanswered runs as the Walla Walla Sweets (12-8) came back to even the series with a 6-1 win at Borleske Stadium. After earning a dramatic come from behind victory last night, the HarbourCats couldn’t muster up any offence off Sweets starter Ty Hueckman. In his fourth start of the season, the University of Nevada Reno product would go six strong innings racking up 8 strikeouts while holding Victoria to three hits in the process. Jeddediah Fagg got the visitors half of the second started with a single, and was brought home two batters later when Malinchak lifted a RBI sacrice fly to deep center field for his fourth run batting in of the season. Justin Solt, who got the nod on the mound for Brian McRae’s crew, was cruising behind a 1-0 lead until the bottom of the fourth when the Lower Columbia College native ran into some trouble with the Sweets sluggers. Solt quickly got the first out of the inning, but would proceed to yield back to back walks before serving up a three run homer to Jordan Hovey — putting the Sweets on top with a 3-1 advantage. The home run to Hovey would prove to be Solt’s only crucial mistake in the contest, as the right hander was solid on the bump going five innings and only giving up three hits in this third start of the season. However, he would still get the loss in the contest, as the HarbourCats bats continued to be stymied by Hueckman and the ‘Pen. The ‘Cats would go down in 1-2-3 order in the fourth, fifth, sixth, and seventh inning, behind stellar pitching from Hueckman and reliever Ben Fariss. 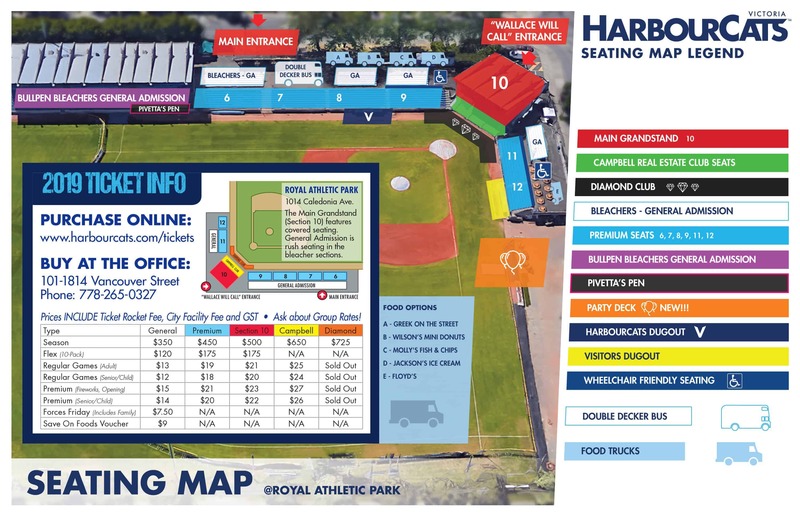 Caleb Ricketts and Nick Plaia attempted a rally for the HarbourCats in the eighth, advancing to scoring position with a single and fielder’s choice respectively to give the ‘Cats a chance to come back, but Fariss escaped the jam by striking out Fagg to end the threat. Fariss would pitch two innings of one hit ball, only giving up a single hit, before turning the game over to his teammate in the bullpen Samuel Reed to secure the Sweets 12th victory. Down to their final three outs in the ninth, Harrison Spohn smacked his fifth double of the season to once again try to get any kind of offence going for Victoria, and Matthew Clayton followed that up with a single in the next at-bat to continue the HarbourCats late threat. However, tonight would not be a repeat of yesterday’s game, as Reed got Tanner Haney to fly out and end the ballgame. The loss dropped Victoria back down to .500, and 4.5 gamed behind the division leading Bellingham Bells with seven games to go in the WCL First Half pennant race. Meanwhile, with the win Walla Walla jumped into a three way tie for first with the Portland Pickles and Corvallis Knights in the South division. The two teams will battle in the series rubber match tomorrow night, as Owen Sharts will counter Tyson Quolas at 6:35pm in Walla Walla.